This okra recipe has been sitting in my computer for the last two days, ready to post, with picture chosen and retouched, etc. Just the introductory notes were missing. 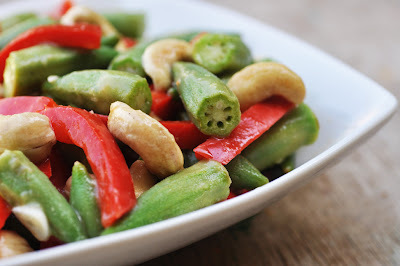 It should be easy for a super dish like this, with superfoods okra and bell peppers being the main ingredients, topped up with some cashews for crunch. Okras are in fact a superfood, full of vitamin K, calcium, fiber, vitamin C, protein, folate, manganese and magnesium. The sliminess of the okra, that makes many people okra haters, is being neutralized in the lemon sauce in this dish. Bell peppers are excellent sources of vitamin A, B6 and C. Cashews are full of copper, magnesium and phosphorus and their fats are the really good unsaturated fats. You know what I am having for dinner tonight? Take-away pizza..... in front of the TV. Heat the olive oil in a deep pan or wok over medium heat. Add sliced garlic and and stir-fry until fragrant, about 1 minute. Add the okras and fry for 3-4 minutes. Now stir in bell pepper slices. Cook for another 2 minutes or until just tender. Heat the vegetable stock and whisk in the flour until all lumps have dissolved. Add the mixture to the okra pepper pan and let simmer until sauce becomes thick. Stir in lemon juice and zest and season with salt and freshly ground pepper. In a dry pan, toast the cashew nuts over medium heat for about 5 minutes or until lightly browned, turning them over once or twice in the course. Stir in the cashews. Transfer to serving bowl. Serve with brown rice or noodles.